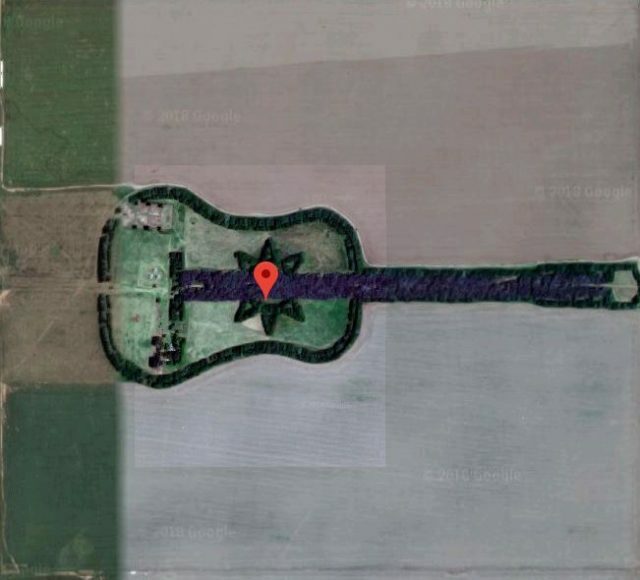 When Pedro Martin Ureta’s wife asked him if they could plant a guitar-shaped field in their farm in Argentina, he laughed it off as a joke. But her sudden death a short time later left him heartbroken, and he decided to undertake the project in her memory. Today, the completed field stands as a tribute to his late wife and is an unusual addition to the vast landscape of the Argentine Pampas. 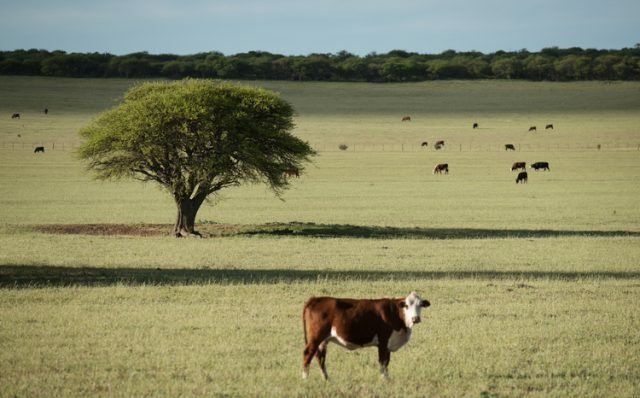 Ureta was a ranch farmer in the 1970s and owned an area of land in the Argentine Pampas, east of Buenos Aires. One day, while flying over the region, his wife Graciela noticed a field in the curious shape of a pail of milk. Amused by the idea, Graciela suggested that they plant a field on their own land that would outline a shape when seen from above. Ureta agreed, but the demands of work and raising a young family meant that the couple never had an opportunity to make their plan a reality. Sadly, however, Graciela passed away suddenly in 1977 at the age of 25 from a brain aneurysm, and Ureta was devastated. He deeply regretted that he had not been able to fulfill his wife’s request and resolved to plant the field in her honor. As his wife had been a life-long lover of music, he decided to design a complex pattern that would resemble a guitar, her favorite instrument. As a recently widowed father of four young children, Ureta made slow progress on the project in the years after his wife’s death. Moreover, his peers thought he was crazy to attempt such a complex design, particularly with no help from professional landscapers. He had no experience in planning a vast project of this nature, and so he taught himself through trial and error. In order to ensure he had marked the distance between each tree correctly, he recruited his children into the project, getting them to stand at fixed intervals to allow him to measure the space evenly. To achieve the perfect effect, Ureta chose cypress trees to mark out the rim of the guitar, its neck, body and the hole in the center, which he designed in a star shape. To represent the strings, he planted five lines of blue eucalyptus, creating a startling multi-colored effect when viewed from above. According to Conde Nast Traveler, his early attempts to get his newly planted forest to thrive were unsuccessful. 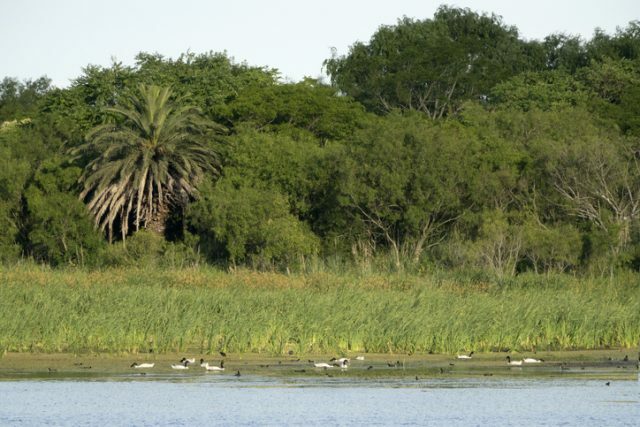 Pests specific to the harsh terrain of the Pampas attacked the young trees, destroying the saplings and setting the project back considerably. However, Ureta persevered, developing an ingenious solution to the problem. He surrounded the saplings with scrap metal, dissuading pests and allowing the trees sufficient room to develop. 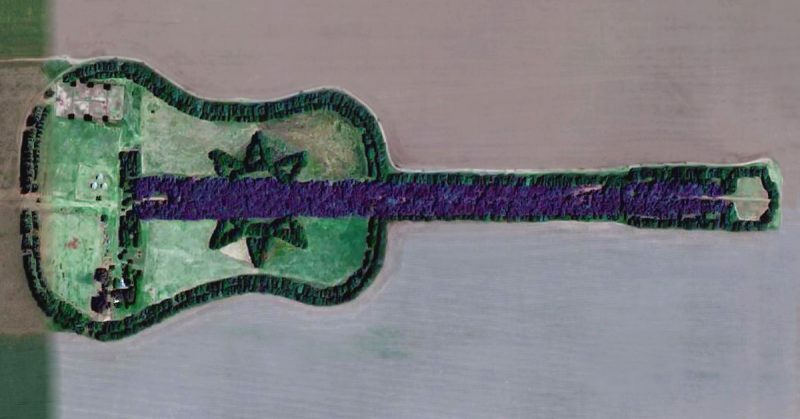 In total, Ureta plated more than 7,000 trees, and after many years of hard work, his guitar forest can now be seen from the air in its full glory. The size of the field far surpassed his wife’s original idea, and extends for two-thirds of a mile. Ureta himself is now a local celebrity, and his unusual creation has been reported all over the world. However, the ultimate irony of the story is that Ureta himself has only seen his guitar forest in photographs. He is scared of flying and so cannot take a flight over his land to admire his handiwork from above. Fortunately for him, and for those of us not in Argentina, it’s also possible to see the field on Google Earth. Ureta’s tribute to his late wife is a true labor of love, and brings a smile to many people who fly over the Pampas. And who knows? Perhaps this guitar will inspire other farmers to construct elaborate designs in their own fields, just as Graciela was inspired by a milk pail all those years ago.